It’s Christmastime, and nothing gets us in the holiday spirit quite like sitting down with a mug of hot chocolate and watching your favorite Christmas movie. 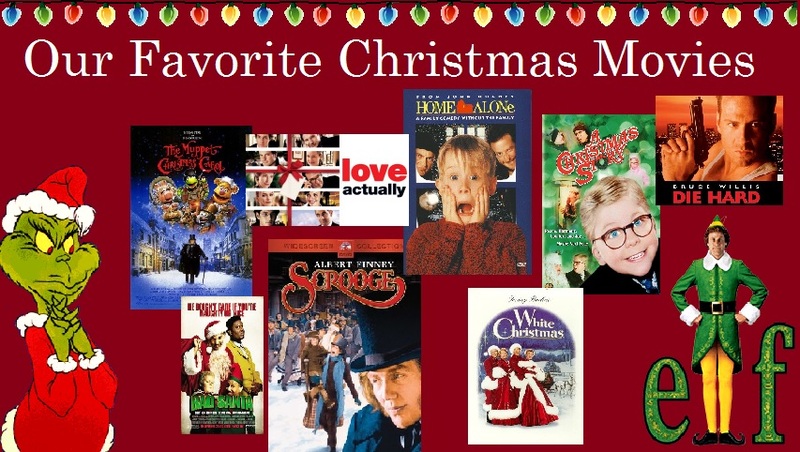 In case you’ve run out of ideas, we have compiled a list of some of the greatest Christmas movies that are sure you get you feeling warm and fuzzy! Elf (2003):Buddy the Elf leaves the North Pole in search of his father, and brings holiday cheer to New Yorkers in the process. This movie is a classic for many reasons, one of which being that it is enjoyable for the entire family regardless of age. White Christmas (1954): After leaving the Army following W.W.II, Bob Wallace and Phil Davis become a top song-and-dance act, where they meet a pair of beautiful sisters who also have an act. When the sisters travel to a Vermont lodge to perform a Christmas show, the guys follow, only to find their former commander as the lodge owner. Packed with Christmas tunes and romantic mix-ups, this movie is definitely a holiday classic. A Christmas Story: Ralphie dreams of a Red Rider BB gun for Christmas, but his mother worries he will shoot his eye out. This classic film brings us back to our childhood and family time during the holidays. Scrooge (1970): A musical retelling of Charles Dickens’ classic novel about an old bitter miser taken on a journey of self-redemption, courtesy of several mysterious Christmas apparitions. Albert Finney is absolute perfection in his role as old Ebenezer. If you’re into musicals, or even not, this is a wonderful holiday classic. Home Alone (1990): As his family heads off on their holiday vacation, young Kevin gets left behind to thwart the crooks casing his parents’ home. What kid doesn’t love binging on junk food, watching violent movies, and building elaborate traps? On second hand, what adult doesn’t love that? How the Grinch Stole Christmas (1966 or 2000): A grumpy hermit hatches a plan to steal Christmas from the Whos of Whoville. How can one celebrate Christmas without the tale of the Grinch and his growing heart? This tale is a classic and both adaptations (cartoon or live-action) are great. The Muppet Christmas Carol (1992): This adaptation of “A Christmas Carol” by the Muppets is surprisingly authentic and a great film for the kiddos and adults alike. Love Actually (2003): Follows the lives of eight very different couples in dealing with their love lives in various loosely interrelated tales all set during a frantic month before Christmas in London, England. Romance and holiday cheer? Yes. Die Hard (1988): John McClane, officer of the NYPD, tries to save his wife and several others, taken hostage by a German terrorist during a Christmas party at the Nakatomi Plaza in Los Angeles. Who doesn’t love a little action with their Christmas cookies? Bad Santa (2003): While not the classic family favorite due to language and some naughty Santa behavior, this hilarious Christmas tale involves Willie Stokes, who moonlights as Santa in order to rip off department stores. This holiday flick is certainly the most joyfully foul movie on our list.